A reader has just tipped me to a new entrant in what i am taking to calling the lottery tablet category (Thanks, Fbone!) Staples is running a sale on an off-brand tablet, the Nobis 7, a tablet from a company I've never heard of before. This 7" wonder sports an unnamed 1.2 GHz quad-core CPU with 512MB RAM, 8GB internal storage, a pair of cameras, all for $49. It runs Android 4.4, which is good, and it also has Google Play, bg/n/ Wifi, a microSD card slot, and a low-resolution 7" screen (1024 x 600). The front-facing camera has VGA resolution, while the rear-facing camera has a resolution of 2MP. Weighing in at 20 ounces, the Nobis 7 has an estimated battery life of 5 to 6 hours. All in all, those aren't bad specs, but I think this is a tablet that is worth avoiding. As I pointed out in my buying guide last month, I have a minimum requirement of 1GB RAM. I also set a minimum price of $60 to screen out tablets made with truly junky components. I'm not in the market to buy a tablet this cheap, but I still like to look. Do you think you'll buy one? While inexpensive, I wouldn’t spend $50 on that. I would rather put the money towards buying a better tablet. Nate, I bought one about a month ago. It fits nicely in a Samsung Galaxy Tab 7 case with a little modification to accommodate the volume button. The quad core processor offsets the 0.5 GB RAM. But the battery life is the only real weak point – knowing full well that this is a cheapie tablet – no illusions here. I like it though. I’ll let you know in a couple of months though. I too bought the 49$ tablet for my husband in 8/2014. Now it wont charge. I took it to a tablet repair place and he said he couldn’t even find parts for it. This is a rip-off tablet and NOBIS should replace them if they are not a year old as long as it is the tablet not working, and not damaged. If you can find a Staples with a Nexus 7 16 GB or 32 GB in stock, the $100 off coupon would make a great buy on those tablets for $99/$159. I purchased this tablet during the Staples’ sale this past weekend. While I love the functions, apps and speed of the tablet, the wifi is so weak that I can’t take it any further than my kitchen or living room where the router is located. All my other devices work well no matter where we are, including out on the back deck. I’m going to take this one back and go ahead and spend the money on one that will give us what we need. I really wish the wifi had been up to par, because I really like this tablet. Made an impulse price buy at $40 from Staples. Quad core and 4.4. Seems well made, very quick, and handles videos nicely. Was looking toward the new Amazon tablet but this is worth the price of a bag of groceries. 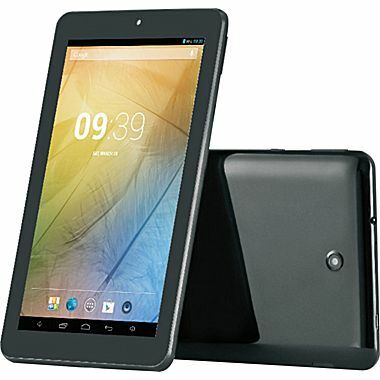 Just a correction staples has the tablet for $59.99 and it has 1GB of memory. I just bought this tablet for my grandson this weekend. It was on sale for $29.99 at Staples. He is only 4 and of course not responsible with electronics. I felt that you can’t beat the price and all he does is play games or watch Thomas video’s. Hopefully will find a case that will hold up to the use of a 4 year old. I am not expecting much for that price. looking for a keyboard case for 7″ Nobis. Anyone know of one. There are keyboard cases which use a USB cable to connect to a tablet, but I’m not sure I can recommend one specifically. My problem is that the case might come with any one of 3 USB plugs, and there’s no way for me to say for sure which plug is on a particular case without having the case in my hands. The best I can do is offer a link to Amazon, and recommend that you ask sellers about the USB plug before you place an order.